Whether you call it cyanuric acid, stabilizer, or sunscreen for your pool, CYA is one of the critical elements that help keep your pool clear and healthy. UV light (which Australia has in over-abundance) causes the depletion of free chlorine. Without CYA, you have to add more chlorine to keep your pool healthy, or run your salt-water generator longer and harder. Adding the correct amount of CYA will therefore save you lots of money – but be careful! Adding too much CYA will cause major headaches as it will prevent your high levels of free chlorine from working. The instructions on the sides of our kit are simplified reminders of the procedure for advanced users (see image below). These are the extended instructions for the CYA Detection Test Kits, that give you all the nitty gritty details on how to test your pool for CYA levels. 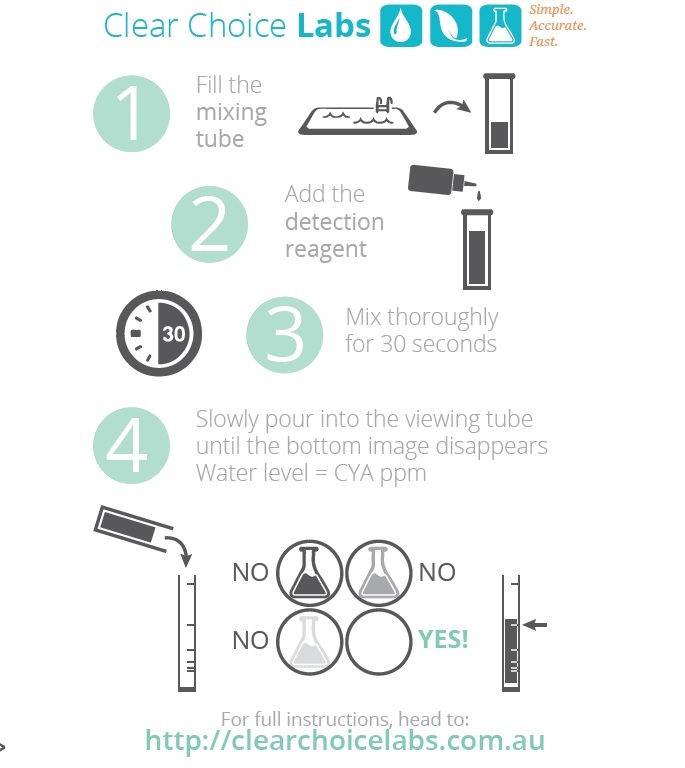 Fill the CYA mixing tube to the mark indicated with CYA Detection Reagent. Replace the lid on the reagent immediately to extend the life of your kit. Note: The accuracy of the test kit will depend on the brightness of the ambient light in which the test is taken. Strong Australian sunlight may cause an underestimate of your CYA level. Dim interior lighting may cause you to overestimate your CYA level. Note: This kit is accurate between 30ppm and 100ppm of CYA. If your levels read above 100 ppm, you will need to dilute your sample to obtain an accurate reading. Mix equal parts of pool water and tap water, test this mix, and multiply your result by two. If your test is below 30ppm, you will need to add more CYA to your pool, and then retest to obtain an accurate reading. Pour the contents of the viewing tube back into the mixing tube. Repeat steps 5 and 6 as often as necessary to obtain confidence in your results. Rinse the sample tube with tap water and store in a cool, dark, and dry place. This entry was posted in Instructions and tagged CYA, cyanuric acid, testing, the basics.